Director Paul Feig's Ghostbusters is currently in production, and fans will get to see an all-new team of spirit chasers as they try to save New York City next summer. There have also been rumors that a Ghostbusters Spinoff is in development, with Sony Pictures eyeing Channing Tatum and Chris Pratt to star. Screenwriter Drew Pearce revealed yesterday that he has "completed work" on the script for this new Ghostbusters adventure. But it sounds like that project isn't happening anytime soon. Producer Ivan Reitman issued a statement earlier today, confirming that the female-centric reboot is the only new Ghostbusters movie in the works. "There has been a lot of excitement recently about what is happening with the Ghostbusters franchise. As the producer of the new Ghostbusters film, I feel the need to clarify. There is only one new Ghostbusters movie and that is the Paul Feig directed version coming next July, presently filming and going fantastically. The rest is just noise." Ivan Reitman's statement is a complete reversal from a previous report back in March. 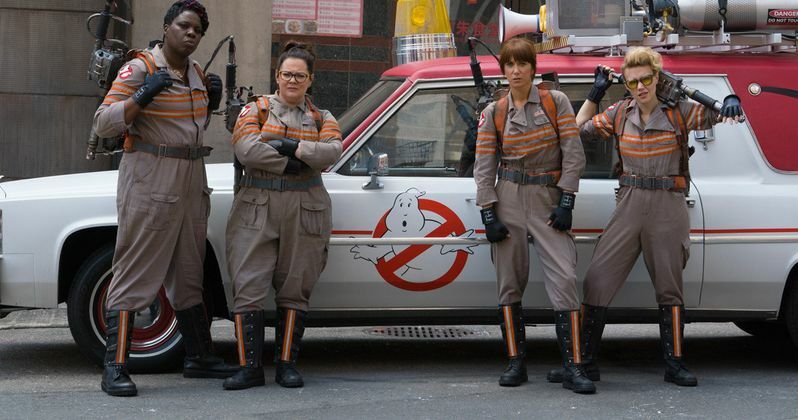 He mentioned writer Drew Pearce by name regarding Ghostbusters 4 to Deadline, stating that the the second film "builds" off of the female-centric Ghostbusters reboot. Here's the producer's official statement from just 5 months ago. "Paul Feig's film will be the first version of that, shooting in June to come out in July 2016. He's got four of the funniest women in the world, and there will be other surprises to come. The second film has a wonderful idea that builds on that. Drew will start writing and the hope is to be ready for the Russo Brothers' next window next summer to shoot, with the movie coming out the following year. It's just the beginning of what I hope will be a lot of wonderful movies." Drew Pearce took to his Twitter page yesterday after his interview was published, to clarify a few things. The work he completed was not an actual script, but just a "bible" that outlines the story, and he clarified that his Ghostbusters team has both males and females. Take a look at his statement below. "For the record, my GB idea has a mixed gender team. Also ghosts of all classes (I to VII). It's very inclusive that way. Also, I've only written a bible (because I have to go off and direct my own stuff). No script yet. So news cycle: CHILL YOUR BOOTS." As for Channing Tatum's involvement, the actor's producing partner Reid Carolin told ScreenRant that they aren't doing Ghostbusters 4 anymore, because, "it's too complicated" and the franchise feels "over-saturated." Chris Pratt also denied any involvement with the project, calling the rumor "total bulls--t." Still, with all of that being said, Drew Pearce did say he has a "bible" ready, hinting that Sony may very well still be developing the project. Although whether or not it comes to fruition, remains to be seen. What do you think about these new developments?